Paul Robert Burris was born on July 21, 1923, in the small town of Hickory, North Carolina, population at the time approximately 6,000. At the age of one, he moved with his family to Charlotte, 50 miles southeast of Hickory. He grew up in Charlotte, and graduated from high school in 1941, having attended both Derita High School and Central High School. In 1942, Burris returned to Hickory and worked in a sandwich shop for 10 months. During this time, he placed a telephone call to the manager of the Hickory Rebels and, as a result of the call, was invited to try out for the team. After a three-day trial, Burris earned the job as backup catcher. He signed his first professional contract with the Hickory Rebels of the Class D North Carolina State League. He soon earned the role of first-string catcher. A “burly” catcher, he weighed in at 190 pounds -- a weight he maintained throughout his career -- and was an even 6 feet tall; he batted right and threw right. Burris played 75 games with the Rebels in 1942 and, in 223 at-bats, averaged .176. That same year, while playing with the Rebels, Burris attracted the attention of a scout for the Brooklyn Dodgers. The Dodgers ultimately signed him as a free agent and sent him to Durham of the Class B Piedmont League. However, due to the strong competition posed by catchers Ferrell Anderson and Bruce Edwards, Burris’ playing time with Durham was limited to fewer than 10 games. Both Anderson and Edwards would go on to the major leagues: Anderson with the Dodgers (1946) and the Cardinals (1953), and Edwards with the Dodgers where he yielded his starter’s role to Roy Campanella. Edwards would play 10 seasons and two World Series with the Dodgers. The outbreak and escalation of World War II interrupted Burris’s career in baseball when he was drafted into the Army. In his 31 months of service, Burris “saw plenty of action” on the Pacific Front, in Guadalcanal and the Philippines. He received an honorable discharge, having achieved the rank of sergeant, in 1946. Also in 1946, the Class D North Carolina State League resumed baseball after having suspended play during the war. Now 23 years old, Burris began playing again, in the North Carolina State League, with the High-Point-Thomasville (Hi-Toms) Dodgers. He caught 74 games and batted .198. During the 1947 season he saw action with the Class B Danville Dodgers of the Three-I League, where he played 117 games and raised his batting average to .287. At Danville, Burris caught Carl Erskine, who that season was 19-9 with a 2.94 ERA. After the season, Burris was drafted from the Dodgers farm system by the Milwaukee Brewers of the American Association, a Braves affiliate. Reportedly, Bob Coleman, manager of the Evansville Bees, a Braves affiliate in the Three-I League, recommended selection of Burris to the Braves front office. Coleman himself was a former major league catcher and had managed the Braves in 1943-45. 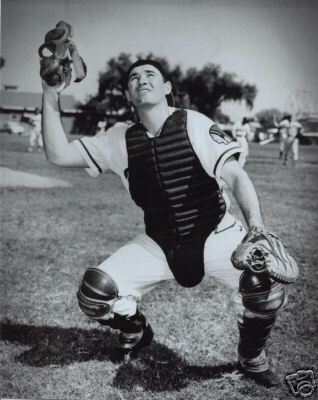 In 1948, despite his 21 errors in 100 games (league high for catchers in the American Association) Burris was called up to the Boston Braves, who had already clinched the National League pennant. Burris made his major league debut on October 2, 1948, at the age of 25. Wearing number 11, he caught Warren Spahn in the first game of the day’s doubleheader against the Giants, going 1-for-1 at the plate. The following day’s game was the final game of the season, and Burris caught again, going 1-for-3. These games were the first two of his 69 career major league games, all played with the Braves. Although he was not eligible for the World Series, he did receive a one-eighth share ($571.34, the same amount received by Johnny Antonelli, who appeared in four games) from the Braves’ Series receipts. For 1949, Burris was initially penciled in as third catcher on the Braves’ staff. However, Del Crandall, Bill Salkeld, and Phil Masi wound up sharing the backstop duties. Burris was returned to the Brewers and played with them for the entire 1949 season. He continued his steady play behind the plate while hitting for a .263 average. The Braves again called on Burris in 1950, keeping him with the team throughout the season, and playing him in 10 games as the backup catcher to Walker Cooper and Del Crandall. Following an offseason operating a soda shop near Charlotte, Burris began his third stint with the Milwaukee Brewers in 1951, where he was the backup catcher to Al Unser, who caught 115 games, batting .293 with 17 home runs. Unser, in organized baseball since 1933, and with major league experience (Tigers and the Reds) appeared in 122 games overall that season, which limited Burris to 48 games. Burris was called up to Boston on September 4, but didn’t get into any games. This season, however, prepared him for 1952, when he would have his most productive major league season. In that season, he played in 55 games for the Braves, with two of his 37 hits representing his entire major league career home run production. His first, a solo shot in the fifth inning of the second game of a doubleheader, came off Carl Erskine, his old Three-I League batterymate, on May 30, 1952, at Ebbets Field. The homer was the only hit Erskine gave up in seven innings of relief. Burris’s second home run, a two-run blast, came on June 12. and was part of Burris’s biggest day in baseball -- he was 4-for-5 with a home run, a double, two singles, and six RBIs. Burris also saw 1952 as an important year personally as he married Bette Burgess. He and Bette had their first daughter, Paula, in 1953. Burris was in the Braves’ spring training camp when, on March 18, 1953, the franchise was transferred to Milwaukee. Notably, in a hastily taken team photograph, Burris is seen between Billy Bruton and Lew Burdette wearing a Milwaukee cap while others sport their old “B” hats. Many years later a collector would issue a black and white “Boston/Milwaukee” team set of baseball cards made up of pre-move player shots, with Burris receiving his own pasteboard after having retired. On June 22, 1953, Burris broke his left elbow in a collision at home plate during an exhibition game with the Braves’ Class C farm club in Eau Claire, Wisconsin. Up to then, he had played in only two games, with just one at-bat. He was placed on the disabled list on July 3 and remained on the DL until September 18. On December 2, 1953, Burris was assigned outright to Toledo of the American Association but Baseball Commissioner Ford Frick ordered that the Braves give him another trial. If he was not retained, the Braves would need to obtain waivers on him before sending him to the minor leagues. Ultimately, Burris was optioned to Toledo of the American Association (the Milwaukee Brewers had moved there after the Braves moved to Milwaukee) and assigned outright on September 20, 1954. He had played his final major league game in Milwaukee on June 4, 1953. He was 30 years old. Burris played well at Toledo in 1954. In 108 games, he batted .265. His playing time, however, began to decrease. Through 1955 and 1956, he saw action with a number of other teams, including: the Jacksonville Braves of the South Atlantic League, the Columbus Clippers of the American Association, the Atlanta Crackers of the Southern Association, the Austin Senators of the Texas League, and the Louisville Colonels of the American Association. At Austin, where he played 13 games, his manager was a 1948 Braves teammate, Connie Ryan. Although the life of a professional baseball player was challenging for Burris’s young family, they had been looking forward to his continued play with the Braves in 1954. His broken elbow and his assignment to Toledo had, unfortunately, affected his career plans. He did stay in the game until 1956 but as he was being used less frequently, he must have recognized that his professional career was coming to a close. He and his family returned to North Carolina to Huntersville, about 10 miles from Charlotte. There he was employed by the Douglas Aircraft Co. and the Duff Norton Co. until his retirement in 1985. Paul Burris died in Huntersville on October 3, 1999, at the age of 76. His obituary in the Charlotte Observer said he “will especially be remembered for his dedication to his family and great love of seeing his grandchildren [Erin and Paul Taylor, Katie and Phillip Carter] play ball.” The obituary also noted that he had once “thrown out Mickey Mantle at second base”, without explaining when that happened. A lifelong member of the Presbyterian Church, Burris was laid to rest in Williams Memorial Presbyterian Church Cemetery in Charlotte on October 6, 1999. Johnson, Richard A. Boston Braves (Images of America: Massachusetts). Charleston, S.C.: Arcadia Publishing, 2001. Kaese, Harold. Boston Braves 1871-1953. Boston: Northeastern University Press, 2004. Peeler, Tim and Brian McLawhorn. Baseball in Catawba County. Charleston, S.C.: Arcadia Publishing, 2004. Podoll, Brian A. The Minor League Milwaukee Braves 1859-1952. Jefferson, N.C.: McFarland & Company, 2003. Catawba County Historical Association. Newton, N.C.
Hickory Public Library. Hickory, N.C.
University of North Carolina. The North Carolina Collection. Chapel Hill, N.C.
State Library of North Carolina. Information Services Branch.